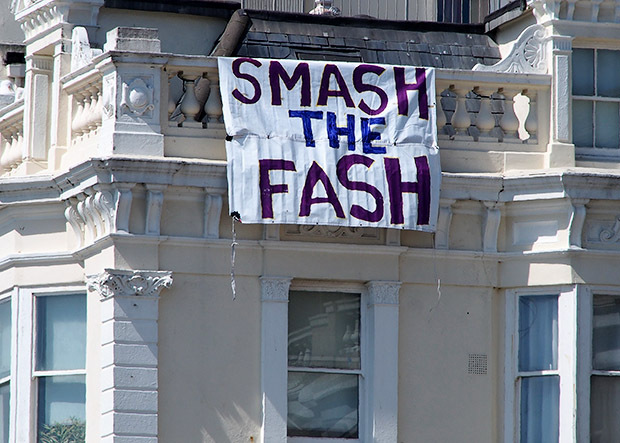 Accounts of Militant Antifascism in the UK from 1970s – Present. No names, nothing dodgy! Any info on Militant anti-fascism in Europe, 1970s- Present especially Germany, France, Scandinavia, Croatia and Serbia. Any relevant press cuttings, online references and book titles 1970s- Present. Photos of demos, pickets etc., of a non-compromising nature and of publishable quality. PS: Accounts from repentant fash welcome – but only if you’re REALLY SORRY! had the courage to stand up against 16 fascist hooligans on a night out in Sofia, Bulgaria. 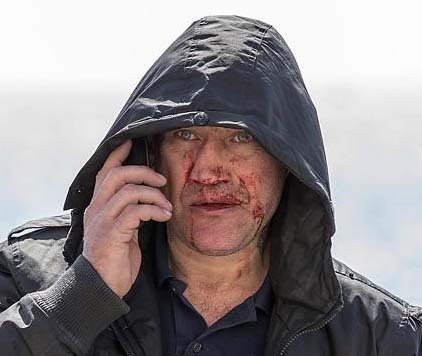 and another, Anton Zahariev was injured. The Roma boys ran away. to a legal loop hole used by the prison authorities. Jocks statement has remained consistent from the night in question. Jock now lost all the appeals and only one left to him is to appeal to European Union Court in Strasbourg. He is also trying to secure his transfer to Australia which proves difficult as Bulgarian prosecution service seems to be determined to keep him imprisoned in Bulgaria. the Bulgarian authorities as possible to accept Jocks transfer. We are in it for the long run- we need to let Jock now that he is not alone in his struggle and any solidarity actions can go long way to assure that. There will be Week of Actions organised at some point in March but we need to build up for that with protest messages being sent continuously as well and awareness being raised about the Jock’s case. The more creative the actions the better. Don’t let Bulgarian state bury this courageous man alive in prison! Don’t let them think that they can get away with it! Another important aspect is, especially for people in Australia , to keep pressure on their authorities to do something in Jocks case and officially demand his transfer as well. Organize solidarity actions outside Bulgarian Embassies and Consulates etc. requests for Jocks appeal to be accepted. It is also vital that we we send as many protest messages to prosecutors directly responsible for blocking his transfer. reprint it and distribute it to anyone you think may send a copy. witnesses. All of whom are prepared to testify in his defence. I ask that the Bulgarian Authorities allow him to be transferred to Australia where he can be closer to his family and stop their attempts to try and keep him imprisoned in Bulgaria. We will continue showing our solidarity and highlighting his case until we are satisfied with the progress. Anti-fascist prisoner Austen has now been moved from Wormwood Scrubs to HMP Stocken in Rutland. Some further details of the prison can be found below, though lots of the information given on the page is generic. Importantly Austen can no longer receive books. In addition you can only send him stamps if the are already affixed to an envelope with the address written in pen. If there is any other important information, or any changes to the above, then we will of course post it up here. At Blackfriars Crown Court on Friday August 19th Jonathan Wood – one of the anti-fascists found guilty of “conspiracy to commit violent disorder” in June – was given a suspended sentence. The convictions of Jonathan and the six other anti-fascists were complete travesties, but we are over the moon that our friend and comrade avoided being sent to prison, as this was a real possibility for him. In the end, Jonathan was given a non-custodial sentence for reasons relating to his personal circumstances. Six antifascists were recently fitted-up and sent to prison. Because of ongoing legal issues, for the moment we are unable to say more about their case, but a full report will eventually be issued. Suffice to say, they have been well and truly fucked over and deserve our fullest support and solidarity. Please write to them. As always, assume your letters are being read by our enemies and ensure you do not compromise your own security or that of others. Also please note that Thomas Blak and Austin Jackson are as yet unsentenced. For advice on writing to prisoners see the Leeds ABC website. La lucha continua! 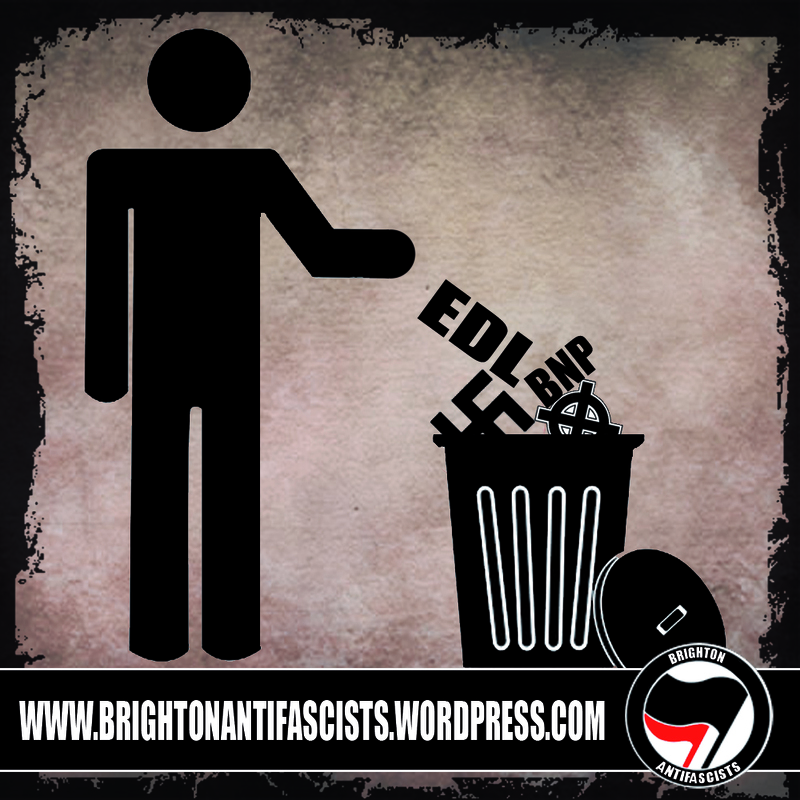 Anti-fascists paint bombed a Brighton pub on Monday (19th) night. The Railway Bell was the meeting point for this year’s March for England (see SchNEWS 769) and has been used by the EDL on previous occasions. Though a splattering of paint is unlikely to cause the fascist hordes to flee, it is the third such incident since the march and this minor economic warfare can deter venues from hosting thugs in future. SUSSEX POLICE FACILITATE FASCIST MARCH!! Organisers of March for England (MFE) in Brighton revealed their true colours today. Despite claims made by Matt Silva (MFE spokesman) in a press release last week, that members of the English Defence League (EDL) and English Nationalist Alliance (ENA) would not be made welcome at their event, the number of recognised EDL and ENA members made up the majority of the attendees. Exposing the MFE organisers as outright liars and proving that what they say cannot be trusted. St. Georges day celebrations were yet again high jacked by the far right today. The MFE march was far from the family event it claimed it would be. Participants of the march hurled racist and homophobic abuse at passers by and anti-fascist protesters whilst being escorted through town by the police. 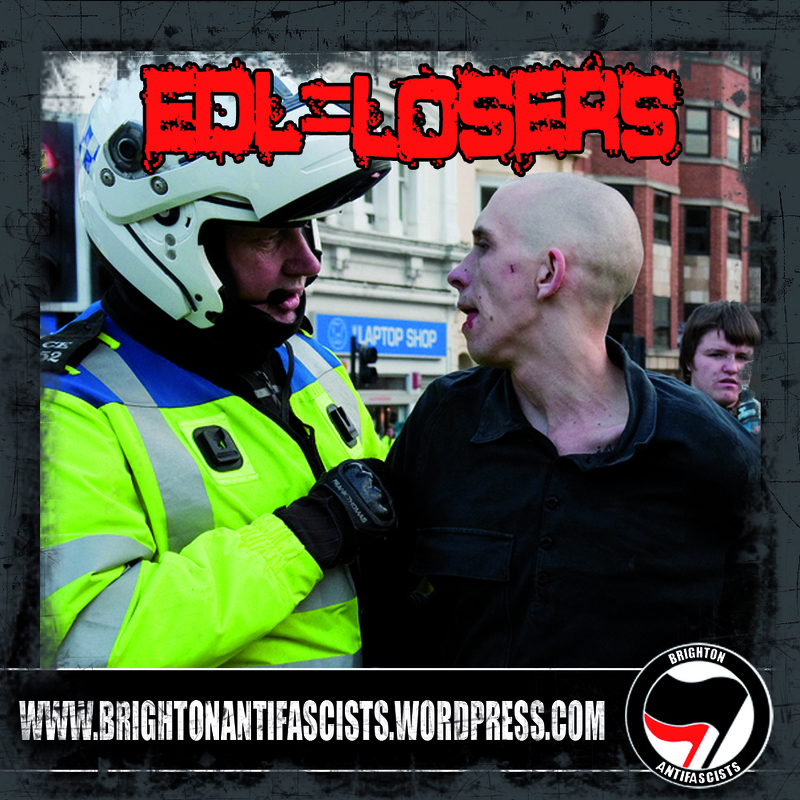 Sussex police did all they could to make the day as carefree as possible for the far right by using kettling tactics against anti-fascist demonstrators and making ‘preventative’ arrests, while the organisers of the march made absolutely no attempt to discourage the abusive behaviour. Not fooled by their attempts to paint a liberal image of themselves ( ie making false statements and waving a rainbow flag whilst shouting “You lot take it up the arse!”) the march was interrupted by anti-fascist demonstrations throughout the day and the MFE didn’t quite get the stroll in the sunshine they may have been expecting. We will continue to oppose any attempts by the far-right to spread their vile and divisive ideology.